Salad then. Cool crunchy green stuff…ripe roma tomatoes, crispy cool cucumber, a sprinkle half a package of crumbled feta, and kalmata olives (mmmm…my favorite) so LOTS of them. No basil, but I guess I don’t actually have to put it in everything! 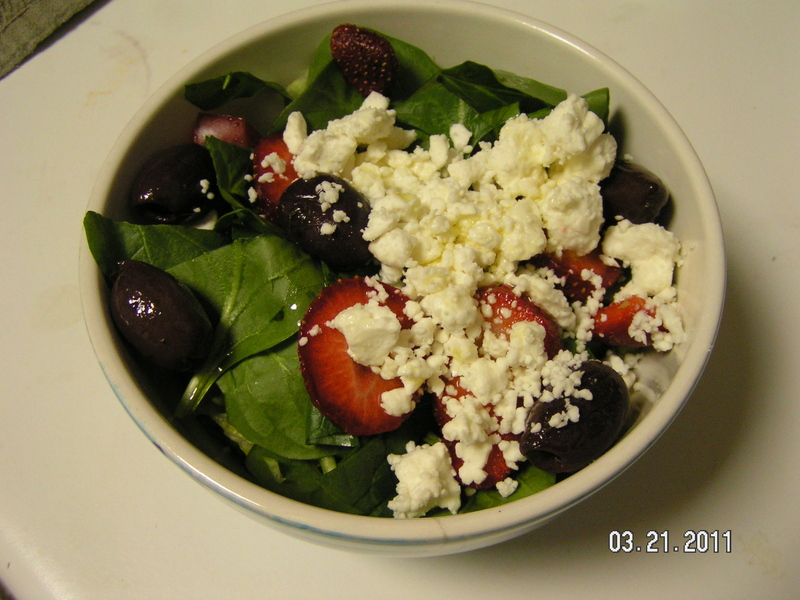 I like to drizzle a bit of garlic olive oil over it, and will sometimes add strawberries or blueberries, as apparently I did when I took this picture. And no, I don’t have a picture of the one today. I’m eating it! Honestly, I think anything seasonal goes well in a salad, even though I’m really fond of the Greek-y flavor…and it’s cool. So cheers to not turning on the oven today!